When Krissie Brown was found in a bathroom, unconscious, just like her late mother Whitney Houston before, transit Neptune was on her MC. 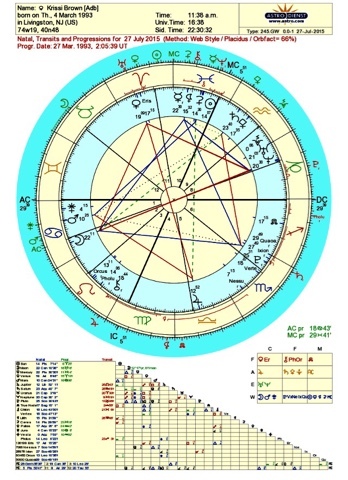 In the natal chart of Krissie Brown Neptune rules Midheaven and is in the 8th house of life and desth, just like Uranus. Now, with transit Uranus exactly square Nepune, she died. Conflicts Uranus-Neptune are conflicts between wake and sleep. This Uranus-Neptune conflict also pops up when there is a hoax or a hype (false news, a flash of gossip). There have been a few false announcements of death in her case lately. This time it seems to be real. In accordance with the symbols of Neptune and Uranus in 8 she suddenly passed away softly in her sleep.